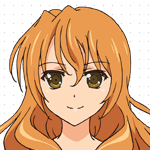 Kouko is a beautiful girl and freshman at Banri's university. Appearing before him and hitting his new friend Mitsuo in the face with a bouquet of roses, she makes a startling first impression on Banri. She is a longtime friend of Mitsuo's and loves him to the point of near obsession, meticulously planning her future with him. Kouko is by all accounts an elegant and confident lady, but is in fact easily driven to despair and depression when she feels her plans have gone awry.